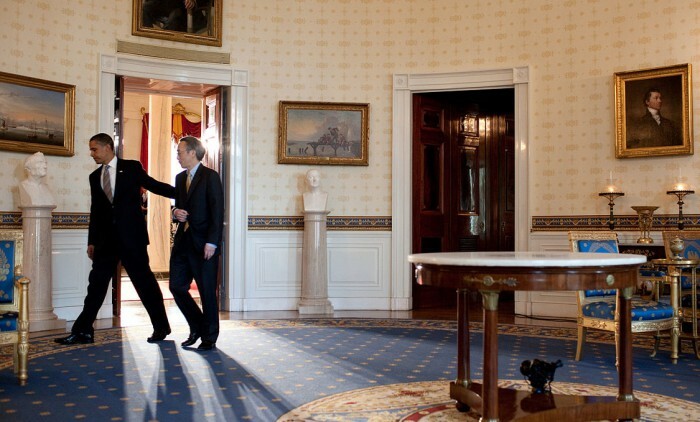 In November 2008, President-elect Barack Obama called Steven Chu, director of Lawrence Berkeley National Laboratory (LBNL), and wanted to meet him in Chicago. During his four years at the Berkeley Lab, Chu had turned this government lab into an innovation hub for energy research and technology. At first, Chu was reluctant to fly to Chicago, but Obama explained that his offer was really exceptional. So the two men met and talked for an hour – and Chu became the first Cabinet secretary with a Nobel Prize. Chu tells this story in his own words in his 2015 Lindau lecture. In his four years as a Cabinet secretary, Chu started a funding programme for “disruptive technology” – energy technology that could change the world, called ARPA-E (Advanced Research Projects Agency–Energy). He established three new Innovation Hubs at the Department of Energy, revitalised photovoltaic and photothermal initiatives with the SunShot programme, and played a crucial role in establishing the U.S.–China Clean Energy Research Center (CERC). In all of this, his main role was to recruit the right experts and then “to block and tackle for them so that the bureaucracy does not drag them down” (also from the 2015 lecture). During the Deepwater Horizon oil spill crisis in 2010, Obama asked Chu to assist BP in closing the sea-floor oil gusher. Again, he helped by recruiting the right experts. 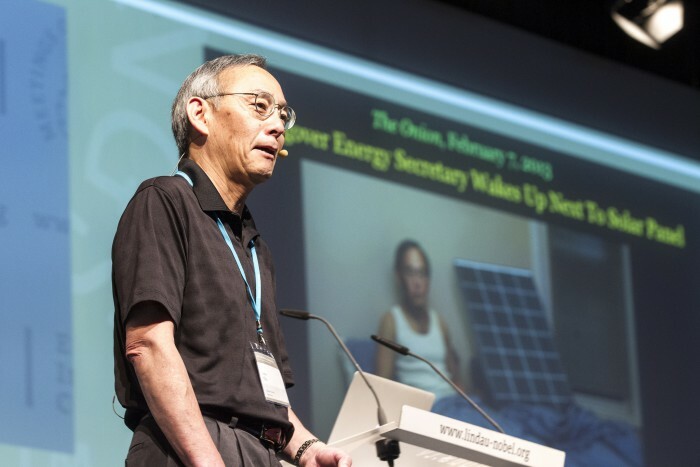 Steven Chu brought his dedication, persistence and creativity as a researcher to politics. But why did he go into this field in the first place – why did he reinvent himself for yet another “life”? 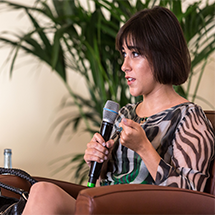 Chu is passionate about climate change and policy. He says: “If necessity is the mother of all inventions, we got the mother of all necessities in climate change.” And as an innovative experimental physicist, he was at the right place at the right time: at the interface between funding, innovation and target formulation: he set the goal to create solar panels that can produce one Watt of electric power for 1 dollar by 2020; an electric car for about 25,000 dollars by 2022, with a car battery that weighs no more than 150 kg, lasts for 300 miles and charges quickly. Despite his many achievements in politics, Steven Chu primarily is a fundamental scientist with a penchant for application. Even as Cabinet secretary, he still headed a research group and wrote scientific papers on weekends or late at night. Decades earlier, in 1997, he had been awarded the Nobel Prize in Physics for the “development of methods to cool and trap atoms with laser light”, he shared this prize with Claude Cohen-Tannoudji and William Daniel Phillips. Already during his doctoral research at the University of California in Berkeley, Chu had built a state-of-the-art laser to tackle questions of quantum physics, for instance to find weak interactions between elementary particles. After switching to Bell Labs, he started to work on cooling and trapping single atoms with laser beams. Chu and his team developed their novel method by employing six laser beams in opposed pairs, arranged in three directions: In this “trap”, atoms can be studied with great accuracy. After moving to Stanford, Chu invented an ‘atomic fountain interferometer’: with atoms in free fall, gravitation can be studied rigorously. This technology helped to build very precise atomic clocks. Even before Chu became LBNL director, at Stanford he had switched from single atoms to biological material. One example: He managed to attach tiny plastic spheres to single DNA molecules, and with the help of fluorescent dye and laser beams, his team could watch the molecules under a light microscope. Currently, his scientific interests cover several areas: his team was able to improve the resolution of light microscopes down to 0.5 nanometers – while he was serving as Secretary of Energy in 2010. The researchers were also able to observe signalling pathways of Ras proteins, proto-oncogenes that play an important role in many human cancers. They found that Ras dimer formation (a complex formed by two molecules) plays a crucial role, so they proposed cancer drugs that should target dimer formation. Here you can hear Chu talk about molecular biology – as if he had never worked in any other field! After his “four year sabbatical” in politics (from his 2014 video), Steven Chu returned to Stanford and became interested not only in super-resolution microscopy, but also in neuroscience. Together with researchers from his “informal neuroscience group”, they were looking for ways to trace a single cell in a living organisms, and came up with different coloured fluorescent particles based on different rare earths. Combined with STED microscopy, they are now working on tracking membrane proteins in the brain during synapse activity. For similar purposes, they also invented fluorescent diamond nanoparticles. As always, Steven Chu has many irons in the fire. 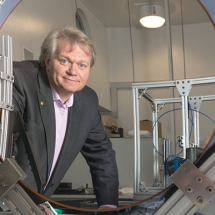 He is not only working on nanoparticles for biological imaging, but also on a layer of interconnected carbon domes: to protect the lithium anode of a next-generation lithium battery. Present-day lithium batteries all rely on graphite or silicon anodes, because lithium is too reactive, produces too much heat, and lithium ions expand on the anode during charging, causing many problems that can even short-circuit the battery. But with a layer of these novel “nanospheres”, a much improved lithium battery comes within reach. This brings us full circle to one of Chu’s targets as Secretary of Energy: safe, efficient and – hopefully – affordable rechargeable batteries, not only for cars, but also for houses or even utility companies. 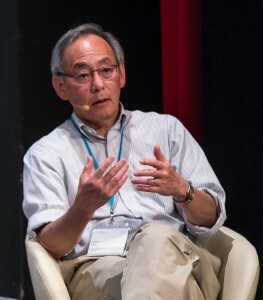 Steven Chu attended five Lindau Nobel Laureate Meetings, giving four lectures – educating and entertaining with every single one. He has worked in the fields of quantum physics, molecular biology, super-resolution microscopy, energy technology development, and finally energy politics (I probably forgot to mention a few). 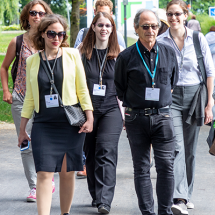 But I’m sure that with these many lives, he has a few more up his sleeve, so we in Lindau are looking forward to hear about them in the meetings to come.